I can't figure out filmmaker Adam Green, as his work shows someone who vacillates between a serious storyteller and a ridiculous fanboy. He's been making movies for 15 years, and his filmography is a mixed bag. Frozen, his best film to date, is actually a suspenseful piece, and Spiral, while a failure, attempts to be a serious movie. Conversely, Green's most well-known films, the Hatchet series, are a silly and pointless group of movies which exist solely to run up the body count. Green is also behind a television show called Holliston which is decidedly hit or miss. Green's latest project, Digging Up the Marrow, attempts to combine all of his interests, but the result continues Green's unbalanced career. Digging Up the Marrow introduces us to none other than Adam Green, who talks about his career and the unusual fan mail which he receives. In particular, he brings up a letter from William Dekker (Ray Wise), a man who has some outrageous claims. Green goes to visit Dekker who explains that monsters live amongst us in the ground, in a realm which he refers to as "The Marrow". Dekker agrees to show Green and camera man Will Barratt the nearest entrance to The Marrow. Green immediately begins to suspect that Dekker is out of his mind and that the whole thing is a hoax. Further investigation into Dekker's background raises more questions. However, when what appears to be a monster is caught on camera, Green becomes determined to learn the truth. Digging Up the Marrow is a faux-umentary, in the sense that we are meant to believe that Green meet Dekker through a fan letter and was ushered into this bizarre world of monsters. However, from the outset, Green wrecks his premise completely by casting a recognizable actor to play Dekker. Ray Wise may not be an A-list, household name, but enough people will see him and say, "Hey! It's Laura Palmer's dad!" for it to be a questionable decision. While I would have never believed that this was anything more than a fictional film, having an unknown actor in the Dekker role would have certainly helped to heighten the illusion. The second problem with Digging Up the Marrow is that Dekker's theories about "The Marrow" are going to see very familiar to the horror aficionados at which this film is aimed. Dekker’s theory is that disfigured or physically challenged individuals disappear and move underground as part of a community of “monsters”. This is basically the same premise of Clive Barker’s 1988 novel Cabal, which was filmed as Nightbreed in 1990. The entrance to the underground realm of the monsters in that movie was in a cemetery, just like in Digging Up the Marrow. But, the biggest part of the movie is that Green doesn’t know how to get out of his own way. The previous two problems aside, I wanted to like Digging Up the Marrow and it does feature two very nice jump scares and a real sense of doom when the group is waiting for the monsters to appear. However, Green can’t resist making himself the star of the movie, and bringing in an appearance by his then wife, which seems very unnecessary. (They are now divorced, as the movie was shot over 4 years.) Green also can’t get away from being a horror fanboy, which I really felt hurt the credibility of the film. For example, he brings Kane Hodder into the editing room to screen some of the footage and get his opinion. Does that name not ring a bell? He played Jason in four Friday the 13th films and Victor Crowley in Green’s Hatchet series. Hodder is obviously a big name amongst horror fanatics, but does his opinion about the authenticity of Dekker’s story really matter. This is clearly just a case of name-dropping. Green works in some other horror directors as well, whose appearances make a little more sense. However, we easily could have done without the footage of Green at horror conventions. I really like the idea of a horror film director being drawn into the world of a delusional fan. This sounds like something which Stephen King would write and I have no doubt that many in the horror field receive some pretty bizarre correspondence. But, Green simply makes too many mistakes and what could have been his most mature work to date comes across as very amateurish at times. Perhaps the real Adam Green will soon arise and make a truly satisfying film. 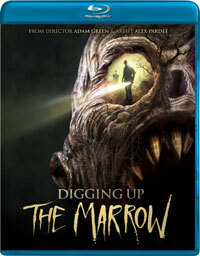 Digging Up the Marrow probably didn’t really go to Boston on Blu-ray Disc courtesy of Image Entertainment. The film has been letterboxed at 1.78:1 and the Disc contains an AVC 1080p HD transfer which runs at an average of 30 Mbps. The bulk of the footage is sharp and clear, showing no grain and no defects from the source material. Shot on HD equipment, the colors look good and the image is never overly dark or bright, even during the dark night scenes. The picture shows a nice amount of depth, and other than some scenes where the person holding the camera is running, the detail is good. The Disc carries a DTS-HD Master Audio 5.1 track which runs at 48 kHz and an average of 3.0 Mbps. The track provides clear dialogue and sound effects. For the most part, the audio comes from the front and center channels. However, the stakeout scenes produce some notable surround sound and the finale offers a few good moments of subwoofer action. The Digging Up the Marrow Blu-ray Disc contains a few extras. We begin with an AUDIO COMMENTARY from Writer/Director Adam Green, Artist Alex Pardee, Cameraman Will Barratt, and Ray Wise. "Monsters of the Marrow" (29 minutes) contains interviews with Green and Pardee, who describe how their collaboration came together and where the idea came from. From there, the special effects and the creature design is discussed, and we see the monsters being sculpted. The Disc contains five DELETED/EXTENDED SCENES which run about 31 minutes. The scenes are preceded by introductions by Green. The final extra is a TRAILER for the film.